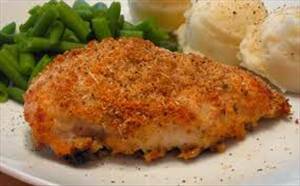 Quick and delightful parmesan chicken with plenty of crunch and no frying. Dip cutlets in egg beaters and dust with breadcrumbs. Brown in pan with non-stick spray. Place browned cutlets in a baking dish. Cover with pizza sauce, spinach, tomatoes and mozzarella cheese. Sprinkle with parmesan cheese. Bake at 325° F (160° C) for about 20 minutes. 1005 members have added this recipe to their cookbook. With egg noodles it's perfetto italiano! Great dish, I used a 15 oz can of pizza sauce for more sauce. perfect for a nice family dinner that everyone enjoys and it took no time at all! Loved it! Tasted so fresh, loved the tomatoes! This was so quick and easy and delicious!! I just had it with a side of green beans - a healthy and filling meal. Really good and still really good the next day. This was really good. I broiled the chicken after baking to brown the cheese on top. Really really really good! Super tasty and healthy chicken breast with sliced mushrooms and red or green peppers. Chicken breast sprinkled with lemon-pepper seasoning and fresh lemon juice. Healthy way to cook snapper with a lovely lemony sauce. Diet friendly barbeque style chicken breasts. Easy to make scrumptious alternative to traditional fried chicken. There are 197 calories in 1 serving of Baked Chicken Parmesan. Calorie break-down: 13% fat, 43% carbs, 44% protein.